In addition, new GOP rules forbid any contests held before April 1 to award all of a state's delegates to the statewide winner. That could be a major concern to Republican leaders in many early-voting states, who used winner-take-all in the past to attract the interest of candidates and enhance their state's influence. If their state votes before April 1 next year, it will be required to provide for the division of delegates proportionately among candidates to reflect their share of the vote. Democrats and Republicans are on the same page when it comes to the 2012 presidential primary and caucus calendar. For both parties, the sanctioned start of the delegate-selection season will be a month later than 2008, with Iowa, New Hampshire, Nevada and South Carolina voting in February, and the rest of the country permitted to weigh in beginning the first Tuesday in March. The two parties have their differences on other facets of the rules, such as winner-take-all versus proportional representation, the awarding of bonus delegates to states and the role of "superdelegates." Still, both parties have adopted rules for 2012 designed to discourage the long-running trend toward "front-loading," characterized by a mad rush of states to a position near the start of the delegate-selection season. 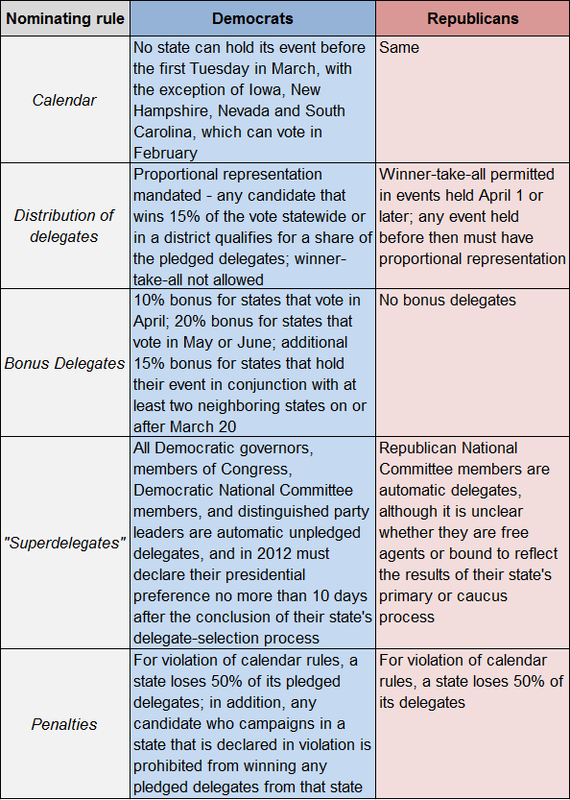 Sources: "Delegate Selection Rules For the 2012 Democratic National Convention" (as adopted by the Democratic National Committee, August 20, 2010); "The Rules of the Republican Party" (as adopted by the 2008 Republican National Convention September 1, 2008, and amended by the Republican National Committee on August 6, 2010). Yet not every state has bought into this line of reasoning. John Ryder, the chairman of the RNC rules compliance committee, still expects there will be “a gaggle, a pride, a covey of primaries” on next year's Super Tuesday, March 6. Florida broke ranks in 2008 to hold its primary a week before Super Tuesday and is threatening to do so again next year. Many Sunshine State politicians figure that as a populous, fast-growing swing state, Florida deserves a prominent early spot on the calendar. “We want to go fifth,” Florida GOP Chairman Dave Bitner recently said, according to the Sarasota Herald-Tribune. If that happens, Florida would vote after the four sanctioned February states but before the glut of those voting in early March. As of now, however, Florida's primary is scheduled for Jan. 31, 2012, which obviously violates the national party's new rules. A final decision on the state's primary date will likely be made early this fall by a 10-member commission stocked by Florida politicians. They appear willing to accept the RNC's penalty for holding an unsanctioned early event: the loss of 50% of Florida's delegates as well as the prohibition on awarding the rest on a winner-take-all basis. A decision by Florida to keep its primary in January, or even to move it back only to early or mid-February, could have even broader consequences. It probably would blow up the entire pre-Super Tuesday calendar, leading Iowa, New Hampshire, Nevada and South Carolina to look at earlier dates for their own events. In other words, there very well could be a repeat of the Christmas and New Year's campaign in Iowa that we had during the last presidential campaign. Note: The caucus turnout in Texas was based on an estimate by the Texas Democratic Party. The Democratic primaries in Idaho, Nebraska and Washington were non-binding "beauty contests" and did not elect delegates. Sources: "America Votes 28" (CQ Press) for 2008 Democratic presidential primary results; "The Rhodes Cook Letter" (June 2008) for 2008 Democratic caucus results.